Orthographic projection of the Indian subcontinent. An assortment of spices and herbs. 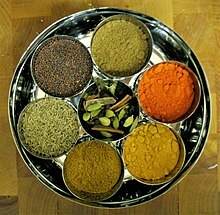 Spices are an indispensable food ingredient in much of the Indian subcontinent. Foods in this area of the world are flavoured with various types of chilli, black pepper, cloves, and other strong herbs and spices along with the flavoured butter ghee. Ginger is an ingredient that can be used in both savory and sweet recipes in cuisines from the Indian subcontinent. Chopped ginger is fried with meat and pickled ginger is often an accompaniment to boiled rice. Ginger juice and ginger boiled in syrup are used to make desserts. Turmeric and cumin are often used to make curries. Common meats include lamb, goat, fish and chicken. Beef is less common than in Western cuisines because cattle have a special place in Hinduism. Prohibitions against beef extend to the meat of (water) buffalo and yaks to some extent. Pork is considered as a taboo food item by all Muslims and is avoided by most Hindus, though it is commonly eaten in Goa, which has a notable Roman Catholic population from Portuguese rule. A variety of very sweet desserts which use dairy products is also found in cuisines of the Indian subcontinent. The main ingredients to desserts of the Indian subcontinent are reduced milk, ground almonds, lentil flour, ghee and sugar. Kheer is a dairy based rice pudding, a popular and common dessert. Many of foods from the Indian subcontinent go back over five thousand years. The Indus Valley peoples, who settled in what is now Northwestern Indian subcontinent, hunted turtles and alligator. They also collected wild grains, herbs and plants. Many foods and ingredients from the Indus period (c. 3300–1700 B.C.) are still common today. Some consist of wheat, barley, rice, tamarind, eggplant, and cucumber. The Indus Valley peoples cooked with oils, ginger, salt, green peppers, and turmeric root, which would be dried and ground into an orange powder. Indians have used leafy vegetables, lentils, and milk products such as yogurt and ghee all along their history. They also used spices such as cumin and coriander. Black pepper which is native to India was often used by 400 A.D. The Greeks brought saffron and the Chinese introduced tea. The Portuguese and British made red chili, potato and cauliflower popular after 1700 A.D. Mughals, who began arriving in India after 1200, saw food as an art and many of their dishes are cooked with as many as twenty-five spices. They also used rose water, cashews, raisins, and almonds. A page from the Nimmatnama-i-Nasiruddin-Shahi, the book of delicacies and recipes. It documents the fine art of making kheer. 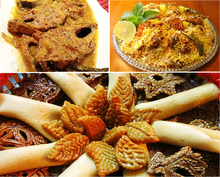 Bangladeshi cuisine is dominated by Bengali cuisine and has been shaped by the diverse history and riverine geography of Bangladesh. The country has a tropical monsoon climate. Rice is the main staple food of Bangladeshi people and it is served with a wide range of curries. Bangladeshi dishes exhibit strong aromatic flavours; and often include eggs, potatoes, tomatoes and aubergines. A variety of spices and herbs, along with mustard oil and ghee, is used in Bangladeshi cooking. The main breads are naan, porota, roti, bakarkhani and luchi. Dal is the second most important staple food which is served with rice/porota/luchi. Fish is a staple in Bangladeshi cuisine, especially freshwater fish, which is a distinctive feature of the country's gastronomy. Major fish dishes include ilish (hilsa), pabda (butterfish), rui (rohu), pangash (pangas catfish), chitol (clown knifefish), magur (walking catfish), bhetki (barramundi) and tilapia. Meat consumption includes beef, lamb, venison, chicken, duck, squab and koel. Vegetable dishes, either mashed (bhorta), boiled (sabji), or leaf-based (saag), are widely served. Seafood such as lobsters and shrimps are also often prevalent. Islamic dietary laws are prevalent across Bangladesh. Halal foods are food items that Muslims are allowed to eat and drink under Islamic dietary guidelines. The criteria specifies both what foods are allowed, and how the food must be prepared. The foods addressed are mostly types of meat allowed in Islam. Bangladeshi people follow certain rules and regulations while eating. It includes warm hospitality and particular ways of serving as well. This is known as Bangaliketa (Bengali: বাঙালি কেতা). The culture also defines the way to invite people to weddings and for dinner. Gifts are given on certain occasions. Bangaliketa also includes a way of serving utensils in a proper manner. Bengali cuisine has the only traditionally developed multi-course tradition from the subcontinent that is analogous in structure to the modern service à la russe style of French cuisine, with food served course-wise rather than all at once. Indian cuisine is characterized by its sophisticated and subtle use of many Indian spicesThere is also the widespread practice of vegetarianism across its society although, overall a minority. Indian cuisine is one of the world's most diverse cuisines, each family of this cuisine is characterized by a wide assortment of dishes and cooking techniques. As a consequence, Indian cuisine varies from region to region, reflecting the varied demographics of the ethnically diverse Indian subcontinent. India's religious beliefs and culture has played an influential role in the evolution of its cuisine. It has influences from Middle Eastern, Southeast Asian, East Asian, and Central Asian, as well as the Mediterranean cuisines due to the historical and contemporary cross-cultural interactions with these neighboring regions. Nepalese cuisine comprises a variety of cuisines based upon ethnicity, soil and climate relating to Nepal's cultural diversity and geography.Dal-bhat-tarkari (Nepali: दाल भात तरकारी) is eaten throughout Nepal.Nepali cuisine has significant influences from Neighboring Indian and Tibetan cuisines. Pakistani cuisine (Urdu: پاکستانی پکوان‎) is part of the greater South Asian and Central Asian Cuisines due to its geographic location and influence. As a result of Mughal legacy, Pakistan also mutually inherited many recipes and dishes from that era alongside India. Sri Lankan cuisine has been shaped by many historical, cultural, and other factors. Foreign traders who brought new food items; influences from Malay cuisine and South Indian cuisine are evident. Wikivoyage has a travel guide for South Asian cuisine. This page was last edited on 4 April 2019, at 23:52 (UTC).